On Friday, August 25, Emmanuel Macron, President of the French Republic, is on an official visit to Bulgaria. This is an opportunity for him, the committed European, to condemn the mafia state installed at the heart of Europe. The French public, the French media, the French elites do not understand how serious the situation is. The case with “Godfather” Delyan Peevski is symptomatic: he is believed to be a leading figure in Bulgarian mafia world and, at the same time, he is the largest media owner in the country and a prominent politician elected successively as a Member of the Bulgarian and the European Parliament. The culmination of the criminal gangrene is the large number of Communist-era state-owned enterprises that fell directly into the hands of the mafia after a wave of large privatizations. This is not without international consequences, and if we have to provide just one example: when Bulgartabac, the state-owned cigarette maker, went under Delyan Peevski’s control, this was followed by an explosion of the smuggling of its cigarettes into the Middle East. The omerta, however, is a rule in Bulgaria. The media keep silent because around 80% of the press in the country is owned by the scheme Peevski: according to Reporters Without Borders, in 2017 Bulgaria was 109th in the global freedom of the press ranking. Potential whistle-blowers keep silent because they are intimidated. By the end of 2016, I myself found a big stuffed toy wolf on the hood of my car, a kind of “Sicilian warning”. Police officers and the judiciary keep silent for fear of ruining their careers or worse. 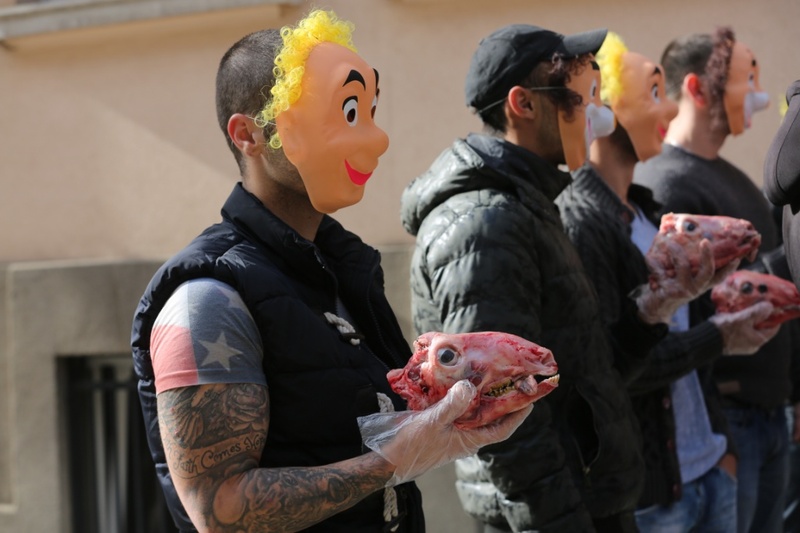 On April 27 in Sofia, the President of the Supreme Courts of Cassations, Lozan Panov, a committed fighter against corruption, was greeted by masked protesters brandishing cut-off lamb heads. And later, when he found that the screw-bolts on the wheel of his bodyguards’ vehicle have been loosened, the Sofia Prosecutor’s Office concluded that this was the result of the poor state of Bulgarian roads. The European Union is fully aware of the takeover of the economy by the mafia and knows that those who refuse to obey are pressured with gangland methods. However, Europe has decided to play ostrich and has been doing it for years. The European Cooperation and Verification Mechanism (CVM), tasked with overseeing Bulgaria’s actual progress in fighting corruption and organized crime, turned over the years into a bureaucratic gibberish and euphemisms. As for the European Commission and the European Parliament, their policy is to refuse to see what they cannot help but see. From January 1, 2018, Bulgaria will assume the rotating Presidency of the European Union. This will undoubtedly be a moment of disgrace for Europe because Bulgaria lets the mafia control its economy, subdue its press and its judiciary. As a pro-European President of the French Republic, Emmanuel Macron must stop this outrage. He must demand that the future Bulgarian Presidency of the European Union be postponed for as long as necessary for the country to clean up its Agean stables. He has to take advantage of his official visit to Bulgaria to officially request the launch of an “Operation Clean Hands” in the Balkan country. He should propose to the European Council of State Leaders the establishment of a truly European anti-corruption oversight for Bulgaria that will be uncompromising and could, for example, be entrusted to OLAF. He could even offer to France’s European partners Bulgaria’s right to vote in the European institutions to be temporarily withdrawn until corruption is seriously under control. Emmanuel Macron campaigned firmly and without restraint on the platform of return of the European ideal. He could not have forgotten that the European Union is above all a community of values: human rights and the rule of law. These values are trampled and derided daily by the mafia system that controls Bulgaria. Therefore, he has a choice: either Emmanuel Macron will dare to initiate an anti-corruption crisis with the Bulgarian authorities and prove that the European ideal exists or decide, like others, to play ostrich in which case he will prove that the European ideal is only smoke and mirrors.